Food for the Soul. It's Me, J.Marie. At any rate, my friends and I have committed to weekly Dinner Club meetings which have served as an excellent way to meet new people, exchange ideas, and create bonds through great food and our love of wine. Last Sunday, we met at my friend Jennifer's house for a potluck dinner. Everyone was responsible for bringing at least one dish and/or a bottle of wine. I brought a 2008 Malbec, which is an earthy red wine that pairs perfectly with hearty meals. While the spread was incredible--garlic rubbed tilapia topped with a corn and black bean salsa, cornbread casserole, macaroni and cheese, Kielbasa with sauteed peppers and onions, and marble cake (just to name a few)--the wine was the most exciting part. 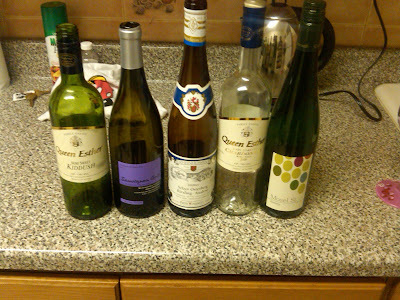 We had about 8 bottles, all very different, yet delicious in their own way. The night went on for hours as we cracked open bottle after bottle, giving our own commentary and rating each one. We decided on a top 5--an organic Kiddush, 2 Rieslings, a honey-infused Chardonnay, and a Savignon Gris. All were to die for. I'm looking forward to moving into my own place very soon and hosting similar dinner parties, with all 5 of these wines on the menu. Definitely a night to remember.